A Skateboard Halfpipe is a dream to skate. A skateboard halfpipe is two quarter pipes facing each other with a flat area in the middle. you can pump back and forth between the two sides and keep your speed going. Doing trick after trick on each side. It is so fun! In the 70's pool skating days of the Z-Boys a halfpipe was a poor man's pool. If you were not lucky enough to have a pool to skate or know someone who does, you could build two curved walls of your own. 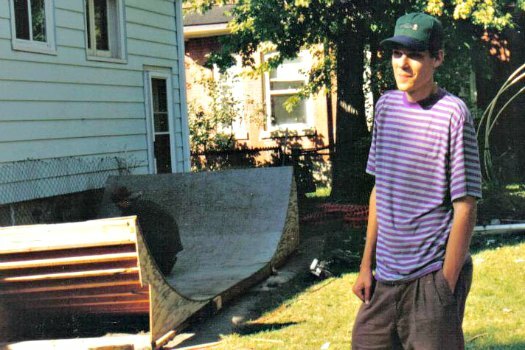 Here is my first attempt at putting together some old ramps into a skateboard halfpipe. If you know someone with a backyard ramp or one in a barn then they become pretty popular. Especially during the winter months when skating outside is impractical due to weather. These ramps evolved to have flat in the middle. Giving you time between each wall to set up for tricks. Halfpipes with two skateable walls facing each other were an innovation. This allowed a more trick focused activity. Rather than taking cruising lines in the connected and curved walls of a pool. The tricks got bigger and so did some of the walls. The ramps started having vertical walls at the top giving more and more speed and easier air time. The vertical part of the wall makes it easier to get air and land on the ramp. These vertical ramps or Vert ramps gave birth to vert skating, well sort of. Metal coping got used at the top of the walls because it grinds good and stands up to the wear of skateboarding. Ramps smaller than that between 2' and 4' can are micro-ramps. They are my favourite, so easy to do lots of different tricks. Mini bowls are even better! There are limitless variations of curved walls to make a skateboard bowl. With different sizes, angles, distances, heights, shapes and so on. You can place two back to back to make a spine. Place different heights and transition side by side. Put roll-ins boxes, rails or gaps along the top. I didn't know what I was doing when I made that first ramp but got it together with some help. It was fun to try. I have learned a lot since then. Built a few more versions and figured out how to get things together . Look in the future for instructions on building a skateboard halfpipe.